A low profile, high strength UHF bowtie, great for HD. Antenna arrives in collapsed form for placement in attic. High definition reception compatible. • Turning Radius: 11.25 in. For Powerful Performance. 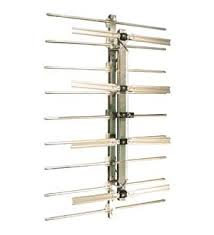 Great UHF reception is accomplished by precise director spacing with efficient corner reflector system. Weak UHF signals are captured and reflected with minimal loss to the driven element for increased uniform gain on all UHF frequencies on Channels 14-69.